Maya builders used corbeled arches to create doorways and interior spaces, which limited the sizes of their rooms. 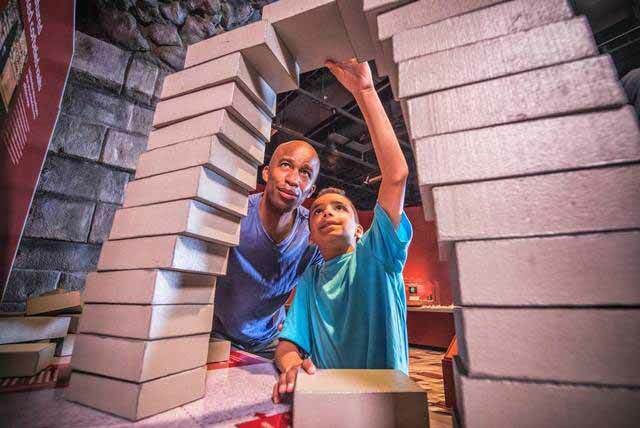 In Maya: Hidden Worlds Revealed, visitors will experiment with building their own corbeled arches out of blocks and explore dozens of hands-on activities that dig into Maya life during the Classic period. How best to tell kids about the Maya civilization without encountering that certain glazed look that has absolutely nothing to do with ancient pottery? You make it fun, with interactive stations that print out their “Maya” name and translate their birthday into take-home stela calendars. Consider it mission accomplished. 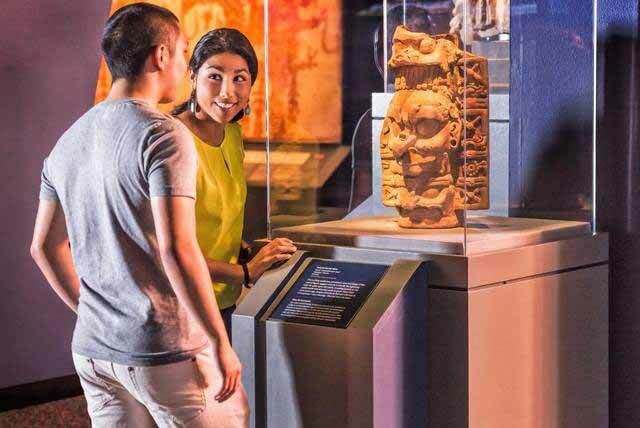 Created by the Science Museum of Minnesota, the Denver Museum of Nature & Science and the Museum of Science, Boston, the 10,000-square-foot “Maya: Hidden Worlds Revealed” is the largest traveling Maya exhibition ever to tour the United States. It is on display now through Sept. 4 at the Perot Museum of Nature and Science. Visitors to Maya: Hidden Worlds Revealed will piece together a Maya pot, just as an archaeologist would in a lab with sherds found in the field. They’ll see how painstaking this kind of work can be and discover what we can learn about the people who made and used them. 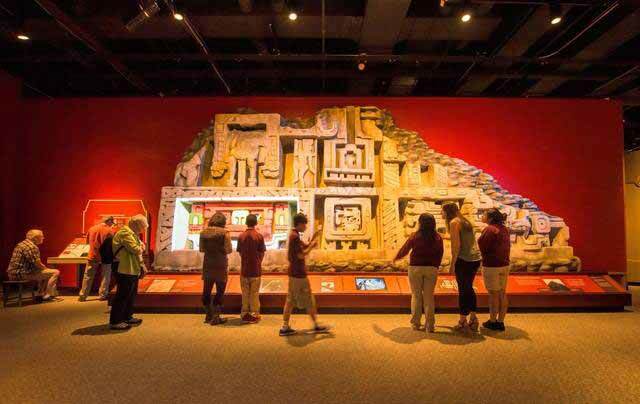 The exhibition features more than 200 artifacts — tombs, an underworld cave, a large-scale burial site and a mural room — plus immersive environments, all of which are the better to explore the accomplishments of this Mesoamerican civilization. Hieroglyphics are the focus of the first set of rooms in the exhibition, and it’s here where the youngsters — plus the young at heart who may not be familiar with what glyphs really are — can get the chance to decipher them. The Maya used censers to burn offerings — food for the gods — and create portals between the human and divine worlds. In Maya: Hidden Worlds Revealed, visitors will see this authentic censer, which features the face of the Lightning God, K’awlil, who splits open the earth to allow seeds to grow. This is one of more than 200 authentic artifacts included in the exhibition. In fact, consider the experiment to be emblematic of what scientists and others have been doing for thousands of years. Some time before AD 200, the Maya devised this written language of more than 800 hieroglyphs, but, according to a wall text in the exhibition, when the Spanish arrived in the 16th century, no one really knew what to make of the symbols. Stuart said scientists actually have been confounded until very recently. At the Maya “Name Glyph Generator,” kids can touch-screen their ways to discovering a personalized Maya name. The interactive display also offers a pronunciation and prints out a card for a take-home keepsake. While return visitors will surely want to head to the adjacent and massively popular permanent Sports Hall exhibit — where, in my experience, it’s nearly impossible to get your kids to leave — this Maya show features its own homage to the civilization’s sporting history. Just try to lift the heavy, rubberized ball (which weighs approximately 8 pounds), and then imagine bouncing it off your hips, channeling the ancient Maya’s exercise practice. The Maya made these balls from the cooked latex of rubber trees and juice from the Morning Glory vine. The elastic mixture was then pulled into strips and wound into spheres. Maya builders reflected their worldview in their colorful and imposing cities. Visitors to Maya: Hidden Worlds Revealed will see this huge re-creation of a section of a famous frieze from the El Castillo pyramid in Xunantunich, a Maya civic ceremonial center, and watch as projection technology “paints” the frieze in the vibrant colors it may have featured thousands of years ago. It’s little surprise that modern-day basketball and soccer owe their origins to the Maya. But LeBron or Lionel Messi likely don’t play with the implications that the Maya did: More than just an enjoyable pastime, the Maya ballgame put religious beliefs into action, with the game’s floor representing an opening to the underworld and the moving ball connoting the sun. And ceremonial games sometimes culminated in human sacrifice. The Maya’s mortality is evident on a greater scale through its architectural accomplishments, from its temples to its modest homesteads. A recreated portion of a famous frieze, from the El Castillo pyramid in Xunantunich, Belize, looms elegantly on a far wall, with a portion of its “original” colors vividly on display. To shine a hands-on light on the civilization’s accomplishments, in this area, amateur architects can build towers and corbeled arches in hallmark Maya style. The exhibit’s final space is notably darker, as if to signal a slight change in tenor. Here’s where patrons can learn about the Mayas’ intrinsic interest in the afterlife and the concepts of ritual and human sacrifice, as well as the civilization’s obsession with astronomy. A short video installation is informative, and perhaps a few TMI bullet points will go over the heads of young kids, but they’ll motor over to the computer that generates their own version of a Maya stela, no worse for wear. In more dramatic fashion is the burial tomb replica, which offers patrons the opportunity to see what a burial chamber might look like to an archaeologist at first look. 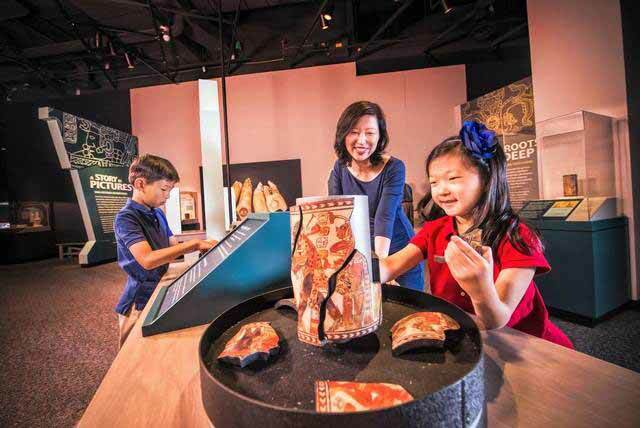 Genuine artifacts such as jadeite ornaments, shell jewelry and decorated pottery are highlighted in the display. Kids will like pushing the buttons, which illuminate various parts of the burial scene, driving home the scope of the life-size diorama. And a small display of ancient indigenous textiles wisely flanks the museum’s Maya exhibition gift shop, meaning you can take a piece of ancient times home with you.